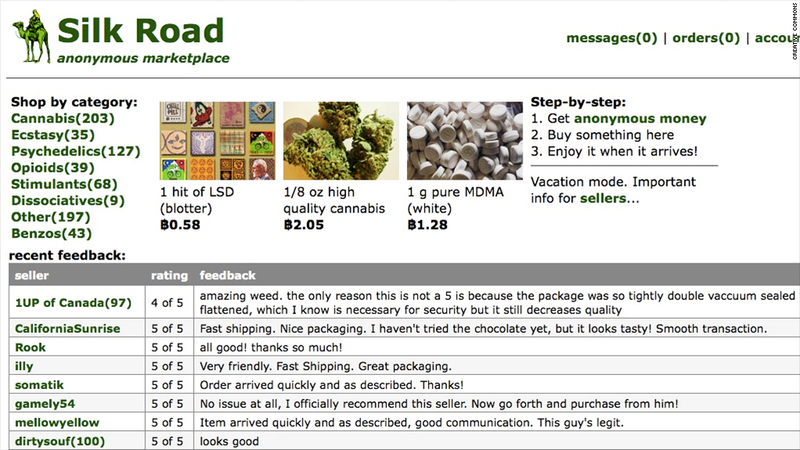 The Feds may have taken down Silk Road, the online black market that's been coined the "Amazon of illegal drugs," but a little over a month later, it's re-emerged. Not long after the bust, select users on the site received an email from a former active Silk Road user asking the community to help rebuild. The authenticity of the new forums was endorsed by former Silk Road user "Libertas." Some users who wanted to be a part of the rebuilding gained access to "the Vendor Roundtable," a forum that outlined the details behind the launch of the new Silk Road. The administrator also called on users to volunteer for a "communication specialist" position in charge of organizing operations. "You will be assigned work to perform based on what needs to be done," read an email reviewed by CNNMoney. Silk Road 2.0 emerged Wednesday alongside a number of other sites offering similar services. The new Silk Road, like the original, offers everything from prescription medication to heroin. "Silk Road is back up," a Twitter user who appears to be the owner of the new site tweeted. "Deja vu anyone? #weriseagain." The new Silk Road owner also took on the pseudonym of former leader Ross Ulbricht, Dread Pirate Roberts. According to a former Silk Road user, the site was rebuilt by most of the major players who were heavily involved in day-to-day operations of the former site. "Silk Road was something that had popularity," the user told CNNMoney on the condition of anonymity. "That made it easy for people to continue down that path. As long as you can convince the bulk of the biggest buyers and sellers to move over to the new platform, it doesn't matter what it's called." Before the original Silk Road was seized by the Feds, it had become one of the most sophisticated and extensive criminal marketplaces on the Internet, according to FBI Special Agent Christopher Tarbell. But it certainly wasn't the only one. Other sites, including BlackMarket Reloaded and the Sheep Marketplace, have also been looking to attract sellers and buyers. "Later on, newer versions that have improved in some way will pop up and regain the trust," another former Silk Road user told CNNMoney. A priority for the reborn Silk Road is information security. The people rebuilding it are baking security measures into the site's code.